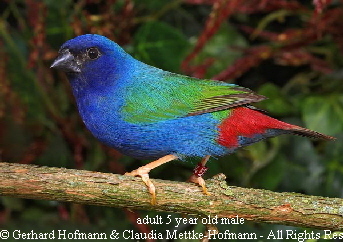 It was not until the sixties of the last century that the first Three-colored Parrotfinches showed up on the bird market in Europe. But this first import was no success and the species soon disappeared. 1989 was not only the year the Berlin wall went down but also the founder year for the Forbes Parrotfinch in Europe. German and dutch avilculturists were the lucky ones who got the species first. The birds were in surprisingly good shape and health hence it took only a couple of months until the first chicks got raised successfully in the Netherlands. Since then this species is a common bird in many aviaries of diligent aviculturists. In the wild, these birds inhabit the forests and rain-forests of Timor and the Tanimbar islands. 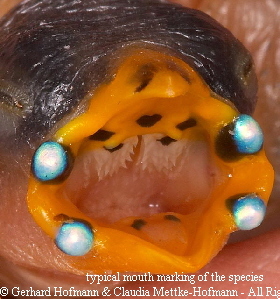 Nearly nothing is known about their behavior or their food in the wild. They are supposed to feed on bamboo seeds and to nest in the crown of coconut-palms. Usually wild caught birds adapted pretty well to the new environment in captivity. They readily accepted new food like spay millet, canary seeds, grass seeds, and a millet mixture. The only problem with wild birds was that they were pretty shy and wild and, therefore, needed some time to really settle down. Because of the excellent breeding results and the recently imposed import ban in Europe we nowadays only get captive-born birds which make things a lot easier. When acquiring new birds I still prefer to make the change for t hem as smooth as possible. I always take with me a small amount of food from the previous owner and only slowly change their diet to the way my birds get fed. A quarantine period is always good better to be safe than sorry. Like most of the Parrotfinches the Forbes Parrotfinch is a very active bird which feels unhappy in a small cage. The will get fat very soon and no longer be the vivacious avian jewel they are in well planted aviaries or in really large breeding cages which should not be smaller the 1,6 x 1 x 1m (l x h x d). As already mentioned Forbes can be shy and skittish but this behavior changes a lot if the birds have the opportunity to seek cover in dense vegetation. Here they sit calm and wait until the danger is over. In large aviaries they are sometimes really hard to detect - although strikingly colored they are perfectly camouflaged when sitting in the green vegetation. No wonder that there are nearly no observation from the wild. 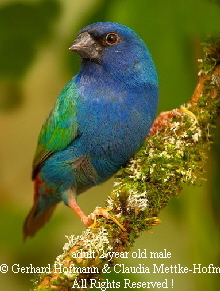 Forbes Parrotfinches are nearly ideal birds if there would not be the tendency to fatten real easily. Another minor problem is their reaction to sudden changes. Be it the weather or the food when something changes rapidly mostly the birds start to molting. Not really ideal for keeping them in outdoor aviaries with our unpredictable weather these days. One of our breeding pairs managed to molt three times in one year so we decided to no longer keep them outdoors for breeding. 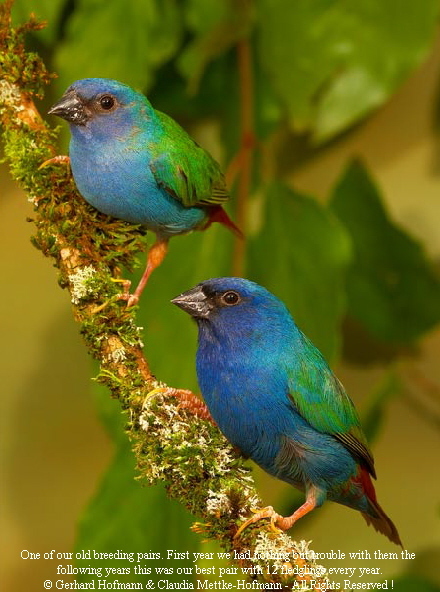 In terms of their social behavior Forbes Parrotfinches are not difficult to house together with other species. But one has to consider that they should not be kept together with species such as Twinspots or Siskins which get lots of livefood or a very nutritious seed mixture. They have the same problem as we humans have; so much good food and not being allowed to eat it is hard to teach them. Species which do well together with Forbes are Red-browed Firetails and different species of Crimson-backs. These species also tend to get fat and should be fed with a special diet like the Forbes. 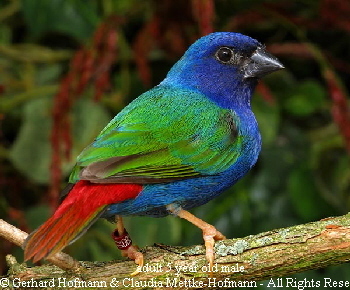 We also housed our Forbes together with Red-headed Parrotfinches which resulted in hybrids. Obviously, the Red-headed male cited some offspring in the Forbes nest. They had two of their own offspring as well as two hybrids in the nest. We realized that something went wrong when we banded the babies two – the hybrids - were way bigger then the other ones. 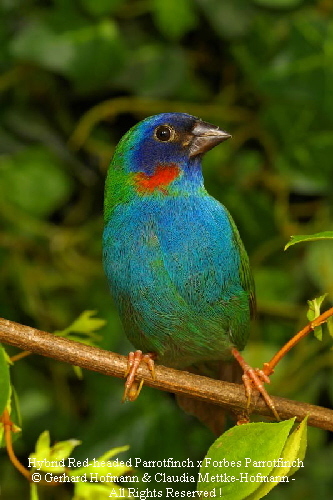 The diet of the Forbes Parrotfinch is similar to the diet of the more common Blue-faced or Red-headed Parrotfinch but should contain less nutritious seeds. We offer a special mixture for Parrotfinches from Blattner as well as a grass seed mixture from the same company. Luckily the birds like these grass seeds particularly Orchard grass followed by annual raygrass and annual Meadow grass very much. The tiny seeds keep them busy and in a healthy body condition. We offer the larger sorts of seeds like white millet and canary seed only during the breeding period. Germinated and soaked seeds are also offered mainly during the breeding season as is half-ripe Millet spray and all kinds of seeding wild meadow grass and chickweed. Nearly all of our pairs are eager for living insects but will also accept frosted insects like Buffalo worms and Pinkies which we mix with a commercial dry eggfood. Most of our pairs won’t raise their offspring without a certain source of animal protein. Sand, cuttle bone, and crushed oyster shell should be available daily, as should crushed baked poultry eggshells and mineralized grit. Additionally, we start to dust the offered seeds with Nekton MSA two months before the breeding season. So far none of our Forbes females ever had egg binding. 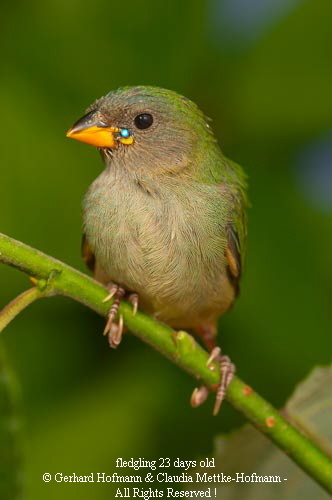 It turned out to be true what the early breeding success at different breeders suggested already - the Forbes Parrotfinch is among the Parrotfinches which are easy to breed. This is also one of the reasons why the birds are so well established among aviculturists despite the relative small founder population. Of course easy to breed doesn’t mean their won’t be pairs which cause trouble. One of the common problems shows up when we candle the eggs. Forbes seem t o have a lower percentage of fertile eggs than other species. The main reason is the birds are simply too fat. In other cases the pair is not getting along. In this case, the pair must be split up and paired again with other mates. The best way to get amicable pairs is to always have several pairs and let the birds choose their partner. As soon as the birds made their choice it is wise to separate them from the other mates. Forbes don’t breed well when they are kept as a flock. The last problem I want to mention is the short period they keep their offspring warm at night. Often the female stays in the nest for only seven nights after the babies hatched. Luckily this was more the case with wild birds or their F1 offspring and is no longer a big deal. Forbes like to build their nests in standard wooden nest boxes which should not be too small, we use boxes with the size of 12 x 12 x 12cm half the front is open. As a forest bird they most likely will choose a hidden shadowed area for their nest. They are happy with coconut fibers as nesting material but will take dry grass and leaves as well. They don’t use feathers or other soft material for lining the nest. Some pairs are pretty nervous. In this case it is a good idea to give the nest some cover so that people cannot look directly into the nest entrance. The clutch size is four to six eggs, after 13-15 days the babies hatch. They are usually naked and can’t be called pretty in my opinion. Forbes are often the most devoted breeding pairs one can imagine and it is usually no problem to control the babies or to band them what is done best at around seven days of age. They stay in the nest for approximately 21 days and can be sexed already after fledging. 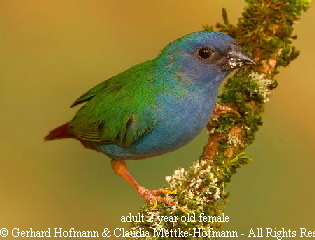 The young males show in most cases more blue than the female siblings. After fledging the young rarely go back in the nest for the night. Usually they sit somewhere in the dense vegetation cuddling with their siblings a behavior they don’t show as adults. In outdoor aviaries, it is now the time to keep an eye on them - a cold night can be already fatal for them. One week after fledging they start to feed on their own but will be fed by their parents for another week. Because the mother may already incubate on another clutch (Forbes are famous for this) mostly the father will do the job. When the babies are too curious and disturb the breeding mother I remove them after they are independent if not I usually remove the young from the first brood when the second brood hatches. Molt into adult plumage takes about two to three months depending on the conditions like temperature, food, humidity. But most likely the one year old birds will look different than the two or three year old mates. The blue is not as intense and less shiny but they made it and they are on their way getting a real avian beauty which is hard to beat by another species.